It has long been understood that fixed brackets, bands, and wires used in orthodontic treatment are convenient areas for the retention of food. In fact, one of the most troubling side effects of orthodontic treatment are white spot lesions left behind after treatment has ended. Since oral hygiene becomes more difficult while undergoing treatment, appliances become a perfect ecosystem for the growth of microorganisms which can cause tooth decay and white spot lesions. Although fluoride varnishes, toothpastes, and sealants are used to mitigate the damage caused by these microorganisms, it is often found that their effectiveness can only be observed when they are regularly used. This disadvantage led researchers to explore probiotics as an alternative. Bacterial therapy or replacement treatment is an alternative way of fighting infections by using harmless bacteria instead of pathogenic microorganisms such as antibiotics. In fact, the benefits of probiotics in the prevention of tooth decay, halitosis, and periodontal disease have been accepted, and more health practitioners are using probiotic treatment for these issues due to the spread of antibiotic resistance in bacteria. Because of this and other perceived health benefits, probiotics can be found in an increasing number of dairy foods including milk, cheese and even ice cream! Research even indicates that probiotics added to a regular daily diet may benefit orthodontic patients as well. 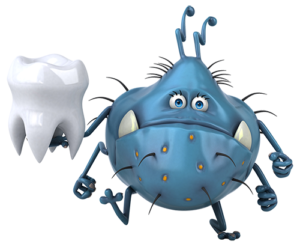 Although the mouth is colonized by 200 to 300 bacterial species, the two main microorganisms that cause tooth decay are Streptococcus mutans (S mutans), responsible for initial tooth decay, and Lactobacillus, which plays a role in those white spot lesions we talked about earlier. Recent studies even suggest the use of probiotic products in orthodontic patients may reduce salivary S mutans and Lactobacillus levels in patients. And while the studies demonstrating the effect of probiotic products and probiotic delivery methods are limited, the good news is researchers did find a decrease in salivary microbial colonizations in orthodontic patients who consumed probiotics daily. For example, in one study researchers explored daily ingestion of probiotics and the application of a topical probiotic toothpaste and their impact on salivary microbial colonizations in orthodontic patients. While the group who used the probiotic toothpaste did see some reduction in harmful bacterial growth, the group who consumed kefir, a bacterial fermented milk, appeared to experience greater decrease in salivary microbial colonizations. While the outcome of this study is promising, more studies are needed to compare the relevant probiotic systems and to evaluate the effect of different probiotic products in the fight against tooth decay in orthodontic patients. In the meantime, consumption of daily probiotics with your doctor’s approval may just help protect your smile and minimize your chances for white spot lesions.